This report describes the isolation and characterization of three new murine mammary epithelial cell lines derived from mammary tumors from MMTV (mouse mammary tumor virus)/activated Neu + TβRII-AS (transforming growth factor [TGF]-β type II receptor antisense RNA) bigenic mice (BRI-JM01 and BRI-JM05 cell lines) and MMTV/activated Neu transgenic mice (BRI-JM04 cell line). The BRI-JM01, BRI-JM04, and BRI-JM05 cell lines were analyzed for transgene expression, their general growth characteristics, and their sensitivities to several growth factors from the epidermal growth factor (EGF) and TGF-β families (recombinant human EGF, heregulin-β1 and TGF-β1). The BRI-JM01 cells were observed to undergo a striking morphologic change in response to TGF-β1, and they were therefore further investigated for their ability to undergo a TGF-β-induced epithelial-to-mesenchymal transition (EMT) using motility assays and immunofluorescence microscopy. We found that two of the three cell lines (BRI-JM04 and BRI-JM05) express the Neu transgene, whereas, unexpectedly, both of the cell lines that were established from MMTV/activated Neu + TβRII-AS bigenic tumors (BRI-JM01 and BRI-JM05) do not express the TβRII-AS transgene. The cuboidal BRI-JM01 cells exhibit a short doubling time and are able to form confluent monolayers. The BRI-JM04 and BRI-JM05 cell lines are morphologically much less uniform, grow at a much slower rate, and do not form confluent monolayers. Only the BRI-JM05 cells can form colonies in soft agar. In contrast, all three cell lines form colonies in Matrigel, although the BRI-JM04 and BRI-JM05 cell lines do so more efficiently than the BRI-JM01 cell line. All three cell lines express the cell surface marker E-cadherin, confirming their epithelial character. 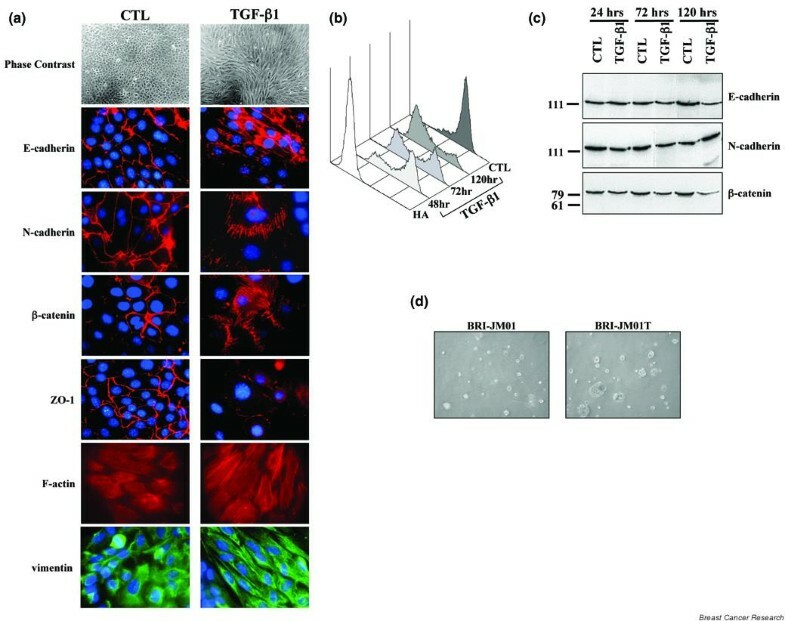 Proliferation assays showed that the three cell lines respond differently to recombinant human EGF and heregulin-β1, and that all are growth inhibited by TGF-β1, but that only the BRI-JM01 cell line undergoes an EMT and exhibits increased motility upon TGF-β1 treatment. We suggest that the BRI-JM04 and BRI-JM05 cell lines can be used to investigate Neu oncogene driven mammary tumorigenesis, whereas the BRI-JM01 cell line will be useful for studying TGF-β1-induced EMT. An understanding of the molecular mechanisms that underlie the neoplastic transformation of breast epithelial cells is dependent upon the isolation of relevant continuous cell culture systems that model breast carcinogenesis and progression. Because transforming growth factor (TGF)-β isoforms are pleiotropic polypeptides that play complex roles in tumorigenesis, it is of particular interest to isolate cell lines with responses to TGF-β that reflect various aspects of this complexity. The ability of TGF-β to inhibit cell proliferation, induce replicative senescence and apoptosis, and maintain genomic stability suggests that it should play a role as a tumor suppressor . Indeed, in a subset of human cancers, in particular those of the gastrointestinal tract, inactivating mutations in the TGF-β receptors or Smad signal transduction molecules have been observed . However, in most other cancers genetic inactivation of TGF-β receptors or downstream effectors appears to be rare. A reduction in TGF-β receptors, rather than a loss, is more commonly observed. For example, reduced expression of TGF-β type II receptor (TβRII) correlated with high tumor grade within both human breast in situ and invasive carcinomas, and has been associated with an increased risk for invasive breast cancer in women with breast epithelial hyperplastic lesions that lack atypia [3, 4]. The observation that TGF-β signaling is rarely completely lost in tumors led to the suggestion that retention of some TGF-β responses may actually be advantageous for tumor cells. The biologic activities of TGF-β that could promote tumor progression include its ability to enhance tumor cell invasiveness and migration, and to inhibit immune surveillance. The clinical significance of these tumor promoting effects was recently highlighted by two reports [5, 6] that showed that a TGF-β antagonist based on a soluble receptor ectodomain could effectively reduce tumor metastasis. The current unifying hypothesis, therefore, is that TGF-β switches from acting as a tumor suppressor to a prometastatic factor during the course of multistage tumor progression [1, 2, 7–9]. When epithelial cancer cells metastasize, they must leave the primary tumor, invade the surrounding tissue, enter the bloodstream, and disseminate to secondary sites. The initial steps in this process involve loss of epithelial cell polarity, dissolution of cell–cell contacts, and acquisition of increased cell motility [10–12] – a process commonly referred to as epithelial-to-mesenchymal transition (EMT). This tumor cell transition resembles, but is not identical to, the phenomenon that occurs when cells of epithelial origin migrate during embryonic morphogenesis . It has been observed that TGF-β stimulation of both nontransformed and tumor-derived cell lines can induce an EMT in culture [14–18]. Study of these cells has implicated several signaling pathways in TGF-β-induced EMT, including Smads, RhoA, phosphoinositide-3 kinase/Akt and p38 mitogen-activated protein kinase (MAPK) [19, 20]. Experiments using Tβ RI mutants that fail to bind Smads have demonstrated that some of these pathways, such as the p38 MAPK pathway, are Smad independent; however, the overall EMT process does require Smad signaling . In relation to studying the role of the TGF-β-induced EMT in breast cancer progression in particular, the nontransformed NMuMG and EpH4 mouse mammary epithelial cell lines are the most commonly used models. Both lines are growth inhibited and undergo EMT when exposed to TGF-β. However, the EMT response of the EpH4 cell line to TGF-β requires the expression of Ras variants that induce hyperactivation of the extracellular signal-regulated kinase/MAPK pathway [22, 23]. Therefore, isolation of additional mammary epithelial cell culture systems that respond to TGF-β with a conspicuous EMT is required in order to elucidate further the pathways that underlie this process. To investigate the effect of reduced TGF-β signaling on mammary gland development and tumorigenesis, we generated a transgenic mouse model that expressed a TβRII-antisense RNA (AS) under the control of the mouse mammary tumor virus (MMTV) promotor. These transgenic animals exhibited precocious lobuloalveolar development of the mammary gland, a phenotype resembling early pregnancy, but no associated mammary tumor development, even at an age of over 20 months . Similar observations were made in two transgenic mouse lines expressing a dominant negative (dn)TβRII in the mammary gland, although in one of these lines spontaneous mammary tumors were observed between 17 and 29 months of age [25, 26]. Overexpression of the ErbB-2/Neu oncogene is associated with malignancy and poor prognosis in breast cancer [27–30]. To study the interplay between ErbB-2/Neu and TGF-β signaling in mammary tumor occurrence and progression, we have now generated a bigenic mouse model in which the MMTV/TβRII-AS RNA is expressed together with an activated Neu receptor, also under the control of the MMTV promotor (MMTV/activated Neu). To date, we have found no significant difference in the latency of primary tumor formation in these bigenic mice as compared with mice expressing the activated Neu oncogene alone (Lenferink AEG and coworkers, unpublished data). However, recently, in related bigenic mouse models in which a dnTβRII was coexpressed with forms of the Neu receptor that selectively couple to different signaling pathways, a decreased latency of Neu-induced mammary tumor formation was observed . The finding that TβRII-AS RNA expression appears to have less effect on both spontaneous and Neu-induced tumor formation, as compared with dnTβRII expression, may indicate that the dnTβRII blocks signaling from other TGF-β superfamily members by interacting with the cognate type I receptors for these ligands. The ability of a dnTβRII to block more than one TGF-β superfamily member has recently been confirmed in MDA-MB-231 cells . To provide breast tumor epithelial cell lines in which the interplay between TGF-β and activated Neu signaling may be studied, and in which TGF-β signaling may be specifically reduced but not eliminated due to TβRII-AS RNA expression, we established cell lines from tumors from both our MMTV/activated Neu + TβRII-AS bigenic mice and the MMTV/activated Neu transgenic mice. In this report we present the characterization of these cell lines, including analyses of the expression of the Neu and TβRII-AS transgenes, of the expression of epithelial markers, and of their responses to TGF-β and ligands that signal through ErbB receptors. In two out of three cell lines, Neu oncogene expression was maintained. Expression of the TβRII-AS transgene was not maintained in any of the cell lines. Most significantly, we found that one of the cell lines undergoes a striking EMT in response to TGF-β. This cell line will provide an additional in vitro model system for the investigation of the mechanisms and pathways that underlie TGF-β-induced EMT in mammary epithelial cells. Mouse monoclonal β-catenin and N-cadherin antibodies were purchased from Transduction Laboratories (Mississauga, ON, Canada), a monoclonal E-cadherin antibody (anti-uvomorulin clone Decma-1) was purchased from Sigma (Oakville, ON, Canada), and monoclonal anti-ZO-1 and anti-vimentin antibodies were obtained from Chemicon International (Temecula, CA, USA) and ICN Biochemicals Inc. (Irvine, CA, USA), respectively. Polyclonal ErbB-1, ErbB-2, ErbB-3, and ErbB-4 antibodies were purchased from Santa Cruz Biotechnology (Santa Cruz, CA, USA), a monoclonal ErbB-2/Neu antibody was obtained from NeoMarkers (Fremont, CA, USA), and a monoclonal anti-phospho-tyrosine antibody (clone 4G10) was purchased from Upstate Biotechnology (Charlottesville, VA, USA). Horseradish peroxidase conjugated secondary antibodies were obtained from Jackson Immuno Research Laboratories Inc (West Grove, PA, USA). Texas-red conjugated anti-rat and anti-mouse antibodies, Texas-red conjugated fungal toxin phalloidin, and Alexa-488 goat-anti-rat conjugates were purchased from Molecular Probes (Eugene, OR, USA). The FITC-conjugated anti-goat antibody was obtained from Santa Cruz Biotechnology and the rat anti-HA antibody was purchased from Boehringer-Ingelheim (Burlington, ON, Canada). Recombinant human epidermal growth factor (EGF) was obtained from Austral Biologicals (San Ramon, CA, USA), heregulin (HRG)-β1 from NeoMarkers, and recombinant human TGF-β1 and TGF-β2 were purchased from R&D Systems (Minneapolis, MN, USA). Mink lung cells (Mv1Lu) were obtained from the American Tissue Culture Collection (ATCC; Mannasas, VA, USA) and routinely cultured in Dulbecco's modified Eagles medium (DMEM; Wisent Inc., St.-Bruno, QC, Canada) supplemented with 10% fetal bovine serum (FBS; HyClone Laboratories Inc., Logan, UT, USA). Murine myeloma NS0 cells (a kind gift from C Guilbault) were maintained in DMEM/NCTC 109 medium (4:1; vol/vol) containing 10% FBS. All cell lines were cultured at 37°C in a humidified 5% carbon dioxide atmosphere. FVB control and FVB MMTV/activated Neu transgenic mice were purchased from Charles River Laboratories (Wilmington, MA, USA). C3H×C57Bl/6 mice expressing MMTV/TβRII-AS  were backcrossed eight times with FVB mice and then interbred to generate mice expressing the MMTV/TβRII-AS on a congenic FVB background. These mice were mated with FVB MMTV/activated Neu transgenic animals to generate FVB MMTV/activated Neu + TβRII-AS bigenic animals. All offspring were screened for transgene expression by PCR using genomic mouse tail DNA. Neu (5'-GAAGGCACTGCCTCTCCGC-3') and TβRII-AS (5'-TTGTGGTTGATGTTGTTGG-3') specific primers were both used in combination with a polyadenylation signal specific primer (5'-CTCTGTAGGTAGTTTGTCC-3'), applying the following conditions: 94°C for 1 min; 34 cycles of 94°C for 30 s, 48°C (TβRII-AS) or 55°C (Neu) for 30 s, and 72°C for 1 min; followed by 72°C for 2 min. Immediately after weaning, virgin MMTV/activated Neu and MMTV/activated Neu + TβRII-AS expressing female offspring were palpated twice a week for tumor formation. Mammary tumors were harvested, washed twice in ice-cold phosphate-buffered saline (PBS; Wisent Inc), cut into small pieces and incubated in trypsin/EDTA (Wisent Inc.) at 4°C for 30 min, while rocking. Cell suspensions were washed twice with ice-cold PBS, and resuspended in a mixture of DMEM and Ham's F12 (1:1) supplemented with 5% FBS and antibiotics/antimycotics (Wisent Inc.). The cells were further propagated in this medium, which is subsequently referred to as DF/5% unless otherwise stated. The BRI-JM01 and BRI-JM04 cell lines were isolated by harvesting nonadherent cells 3 hours after plating the tumor suspension. These nonadherent cells were then reseeded and cultured for 3 days. Clusters of epithelial cells were then isolated and transferred to a 24-well plate for further propagation. The BRI-JM05 cell line was established by seeding the tumor cell suspension in growth factor reduced Matrigel without phenol red (Beckton Dickinson, San Jose, CA, USA). Cells were maintained in Matrigel until 'tree-like' structures appeared, which were then recovered using MatriSperse (Beckton Dickinson), rinsed twice with ice-cold PBS, resuspended in DF/5%, and further propagated on tissue-culture plastic. PCR and RT-PCR analysis were used, respectively, to screen the harvested mammary tumors and generated cell lines for the presence and expression of the activated Neu and TβRII-AS transgenes. Total RNA was isolated from frozen tumors or 2.5 × 106 BRI-JM01, BRI-JM04, and BRI-JM05 cells using Trizol (Invitrogen-Life Technologies, Burlington, ON, Canada). PolyA+ RNA was obtained using Oligotex resin (Qiagen, Mississauga, ON, USA), further purified using DNAse I (NEN-Life Technologies, Boston, MA, USA), and quantified using Ribogreen (Molecular Probes). First strand cDNA was synthesized in a final volume of 20 μl using 1 μg polyA+ RNA, an 18-base poly(dT) primer, and 200 units Superscript II (Life Technologies). Of this first strand reaction, 2 μl was used in a PCR reaction using Neu or TβRII-AS specific primers under the conditions described for screening of the transgenic mice. Screening of the BRI-JM01 cell line for the presence of TβRIII mRNA transcripts was carried out using two sets of primers (set 1: 5'-CCT-CCT-CCA-CAG-ATT-TT-CCA-3' and 5'-TGA-GTG-CTC-CCT-ATG-CTG-TG-3'; set 2: 5'-ACG-ATC-CAT-GAC-AGT-GAC-CA-3' and 5'-GAA-GCT-CAG-GAG-AAT-GGT-G-3'). For the RT-PCR reactions we used glyceraldehyde-3-phosphate dehydrogenase (GAPDH) as control (5'-ACC-ACA-GTC-CAT-GCC-ATC-AC-3' and 5'-TCC-ACC-ACC-CTG-TTG-CTG-TA-3'). The conditions used for both GAPDH and TβRIII PCR reactions are similar to those described for the Neu amplification. Plating efficiency of the three cell lines was determined by seeding 40, 75, 150, 300, 600, and 1250 cells/well using six-well plates. After 7 days the wells were rinsed with PBS, the adherent colonies were stained with crystal violet (0.2% weight/vol in 100% ethanol) for 5 min and rinsed with water, and colonies visible were counted. The plating efficiency was calculated as follows: (number of colonies/number of cells seeded) × 100. Population doubling time of the three cell lines was determined by seeding 1 × 105 cells/well using six-well plates. Cells were trypsinized after 24, 48, 72 and 96 hours of culturing and counted using a hemacytometer. The anchorage-independent growth of the three cell lines was studied by plating 105 cells in 0.3% agarose on top of a layer of 0.6% agarose, both in DF/5%, using 100 mm dishes. Cells were fed every week and colony growth was evaluated by light microscopy after 7, 14, and 21 days of culturing. The ability of the BRI-JM01, BRI-JM04, and BRI-JM05 cell lines to grow in three-dimensional culture was evaluated by seeding 5 × 104 cells in growth factor reduced Matrigel (Becton Dickinson) using 12-well plates. In addition to these cells, we also seeded BRI-JM01 cells that had been exposed to TGF-β1 for 48 hours and subsequently cultured for more than five passages in the absence of this growth factor. Cellular structures were evaluated 1, 2, and 3 weeks after seeding by light microscopy and documented using a Leitz Labovert (Leitz, Wetzlar, Germany) inverted microscope. The cell cycle distribution of the three cell lines was determined by flow cytometry. Briefly, exponentially growing cells were trypsinized, washed and resuspended in ice-cold PBS, and fixed in 70% ethanol (4°C). Cells were washed the next day with ice-cold PBS, treated with 1 mg/ml RNAse in PBS (15 min at 37°C), and stained (30 min at room temperature) with propidium iodide (Molecular Probes) to a final concentration of 50 μg/ml in PBS before analysis. Cell populations were selected by forward and side scattering using a 488 nm dichroic long pass filter, and doublets were discriminated using the peak versus the integrated signal of propidium iodide red fluorescence (645 nm dichroic long pass and 620 nm band pass filter set). Data were analyzed using Multicycle Software (Phoenix Flow Systems, San Diego, CA, USA). The epithelial character of the cell lines was evaluated by cell surface E-cadherin expression. Cells were harvested using nonenzymatic cell dissociation buffer (Sigma), then washed twice with 10% FBS containing ice-cold PBS (PBS/10%), and incubated (20 min at 4°C). Cells were pelleted, resuspended in PBS/10%, divided into three equal portions, and incubated with an E-cadherin antibody (1:1600), a control isotype equivalent antibody (anti-HA; 1:1600), or a secondary antibody Alexa-488 (1:400) in PBS/10% (1 hour at 4°C). The cells were rinsed twice in ice-cold PBS/10%, incubated with Alexa-488 secondary antibody in the dark (1 hour at 4°C), washed twice with ice-cold PBS/10%, and finally resuspended in 1 ml PBS. Viable cell populations were selected using forward and side scattering parameters with a 488 nm dichroic long pass filter. FITC or Alexa green fluorescent emission was detected using a 550 nm dichroic long pass and 525 nm band pass filter. Both cell cycle distribution and the cell surface E-cadherin expression of the three cell lines were analyzed using a Coulter EPICS™ XL-MCL flow cytometer (Beckman-Coulter, Fullerton, CA, USA) equipped with a 15 mW at 488 nm argon ion laser as the excitation source. Mv1Lu and BRI-JM01 cells (2 × 104 cells/well), and BRI-JM04 and BRI-JM05 cells (4 × 104 cells/well) were seeded in 24-well plates. The next day, cells were incubated for 4 hours in either serum-free (recombinant human EGF and HRG-β1) or medium containing 1% FBS (TGF-β1), after which serial dilutions of recombinant human EGF, HRG-β1 or TGF-β1 were added. After 24 hours, cells were pulse-labeled for 3 hours by adding 0.5 μCi [3H]thymidine/well (Amersham, Piscataway, NJ, USA). Cells were then rinsed with PBS, trypsinized, and harvested using a cell harvester (Cambridge Technology, Cambridge, MA, USA). [3H]thymidine incorporation was determined by scintillation counting (Universol; ICN Biochemicals Inc.) using a β-counter (LKB-Wallac, Turku, Finland). Mv1Lu and BRI-JM01 cells were seeded at a density of 1 × 105cells/well, and BRI-JM04 and BRI-JM05 cells at a density of 2 × 105cells/well, using 12-well plates. The next day, cells were cross-link affinity labeled with 100 pmol/l [125I]TGF-β1 (NEN-Life Science Products) or [125I]TGF-β2 (iodination according to Philip and O'Connor-McCourt ) in the absence or presence of 100× excess unlabeled TGF-β1 in 300 μl binding buffer (D-PBS/Ca2+/Mg2+, 1 mg/ml BSA; pH7.4). Receptor bound ligand was cross-linked using Bis(sulfosuccinimidyl) suberate (Pierce Biotechnology, Rockford, IL, USA), as described previously . Cells were solubilized (1% Triton X100, 10% glycerol, 1 mmol/l EDTA, 20 mmol/l Tris-HCl; pH 7.4) and equal amounts of total protein were resolved on a linear 3–12% gradient SDS-PAGE. Immunoprecipitations of the labeled receptor complex were performed using antisera directed against activin receptor-like kinase (ALK)-1, ALK-5 (Tβ RI) or ALK-7 (antisera kindly provided by Dr P ten Dijke ), TβRII and TβRIII, before SDS-PAGE. For treatment of the cells with glycosaminoglycan-cleaving enzymes, subconfluent monolayers were treated with 100 mU heparinitase I, II and III, and 10 mU chondroitinase ABC (Ibex Technologies, Montreal, PQ, USA) in 200 μl binding buffer (3 hours at 37°C) before cross-link affinity-labeling with 100 pmol/l [125I]TGF-β1 or [125I]TGF-β2. Gels were fixed (1 hour, 10% HAc/30% MeOH) at room temperature and dried, and [125I]TGF-β cross-link affinity labeled proteins were imaged using a PhosphorImager 401E and analyzed using ImageQuant software (both purchased from Molecular Dynamics, Sunnyvale, CA, USA). Cell motility was determined using two independent assays. For the wound closure assay, cells were seeded at a density of 2 × 105 (BRI-JM01) and 4 × 105 (BRI-JM04 and BRI-JM05) cells/well in 12-well plates in DF/5% and grown to confluency. Monolayers were then 'wounded' with a pipet tip and the ability of the cells to migrate into this 'wound area' was monitored in the absence or presence of 100 pmol/l TGF-β1. For the 'black ink assay', 24-well plates were coated with ink according to Al-Moustafa and coworkers , with modifications. Briefly, 24-well plates were coated with 0.1% gelatin (30 min at 37°C). Excess gelatin was aspired from the wells, and a black ink solution (Demco, St.-Lambert, PQ, Canada; 1:3 dilution in sterile ddH2O) was added, covering the bottom of the wells. After 5 min, the excess ink was removed and the wells were rinsed vigorously with sterile ddH2O and finally PBS. Cells were seeded immediately after the ink-coated wells were prepared at a density of 2 × 104 cells/well in DF/5% in the absence or presence of 100 pmol/l TGF-β1. Cell motility in both assays was determined 24 hours after TGF-β addition using a Leitz Labovert inverted microscope. The ink particle-free tracks, produced by the migrating cells in the black ink assay, of five microscopic fields were quantified using ImageJ freeware http://rsb.info.nih.gov/ij/. Differences in endogenous and TGF-β1 induced motility between the three cell lines was expressed as the relative fold/cell per 24 hours using the least motile BRI-JM05 cell line as a standard. BRI-JM01 cells were seeded in glass chamber slides (Lab-Tek, NalgeNunc International, Rochester, NY, USA) at a density of 1 × 104 cells/0.8 cm2 in DF/5%. A total of 100 pmol/l TGF-β1 was added and the cells were incubated for an additional 24 hours. Cells were rinsed with PBS (repeated after each of the following steps), fixed in ice-cold 100% methanol (10 min), and permeabilized with 0.1% Triton X100 in PBS (5 min at room temperature). Nonspecific sites were blocked (30 min at room temperature) with 1.5% nonfat milk-powder in PBS (PBS/1.5% milk), followed by an incubation with antibodies raised against ZO-1 (1/500), E-cadherin (1/500), β-catenin (1/1000), N-cadherin (1/1000), and vimentin (1/50), all in PBS/1.5% milk. This was followed by incubation with a fluorescently conjugated secondary antibody (1/500 in PBS/1.5% milk) for 1 hour at room temperature. F-actin filaments were stained, after fixation of the cells in 4% paraformaldehyde, with Texas-red conjugated phalloidin (30 min at room temperature). Nuclei were counter stained on all slides (5 min at room temperature) using 0.4 μg/ml 4,6-diamidino-2-phenylindole (Sigma) in PBS. Slides were mounted using antifade (Molecular Probes) and fluorescent images were captured using a cooled Coolsnap CCD digital camera mounted on a Leitz upright microscope. Semiconfluent monolayers of BRI-JM01, BRI-JM04, and BRI-JM05 cells were rinsed with PBS before lysis in CSK buffer (150 mmol/l NaCl, 10 mmol/l Pipes, 30 μmol/l MgCl2, 300 mmol/l sucrose, 2% Triton X-100) supplemented with a protease inhibitor cocktail (Roche Diagnostics, Laval, PQ, USA). The total ErbB-1, ErbB-2, ErbB-3, and ErbB-4 content of the cell lines was determined by resolving 20 μg total protein by 7.5% SDS-PAGE followed by western blotting. The phosphorylation status of the ErbB-2/Neu receptor was determined by immunopreciptation of ErbB-2/Neu, followed by western blotting with a phosphotyrosine specific antibody. Briefly, semiconfluent monolayers of BRI-JM01, BRI-JM03, and BRI-JM04 cell lines were lysed in lysis buffer (150 mmol/l NaCl; 50 mmol/l Tris-HCl, pH 8.0; 0.55% NP-40; 50 mmol/l NaF). Total protein (500 μg) was precleared with protein G sepharose (4 hours at 4°C) and the ErbB-2/Neu receptor was precipitated (16 hours at 4°C) using 2 μg monoclonal ErbB-2/Neu antibodies coupled to protein G sepharose. The next day precipitates were rinsed five times with lysis buffer and resolved by 7.5% SDS-PAGE. The E-cadherin, N-cadherin, and β-catenin content of the BRI-JM01 cells was determined by lysing BRI-JM01 cells in CSK buffer after 24, 72, and 120 hours of TGF-β1 treatment (100 pmol/l final concentration) and resolving 20 μg total protein by 10% SDS-PAGE followed by western blotting. All proteins were transferred to nitrocellulose, nonspecific sites were blocked using 5% non-fat milk powder in TBS (20 mmol/l Tris-HCl, pH 7.6; 137 mmol/l NaCl) containing 0.1% Tween 20 (TBS-T) for 1 hour at room temperature, and filters were then incubated with primary antibody (E-cadherin, ErbB-1, ErbB-2, ErbB-3, and ErbB-4, 1:500; N-cadherin and β-catenin, 1:1000; phospho-tyrosine, 1 μg/ml) in TBS-T/5% nonfat milk (16 hours at 4°C). Filters were washed with TBS-T (3 × 10 min), incubated with the appropriate secondary HRP-conjugated antibody (1:10,000, 1 hour at room temperature) in TBS-T/5% nonfat milk, and washed with TBS-T (3 × 10 min). Immunoreactive bands were visualized by chemiluminescence (Perkin Elmer, Boston, MA, USA). To provide mammary epithelial cell lines that may exhibit a combination of reduced TGF-β signaling due to TβRII-AS expression, and activated oncogenic pathways due to Neu expression, we isolated two cell lines (named BRI-JM01 and BRI-JM05) from tumors from the bigenic MMTV/activated Neu + TβRII-AS mice that we have generated. As a potential control, we also isolated a cell line (termed BRI-JM04) from a tumor taken from an MMTV/activated Neu expressing animal. Our analysis of transgene expression at the level of the tumors using RT-PCR analysis of polyA+ RNA showed that all of the tumors from four bigenic MMTV/activated Neu + TβRII-AS mice expressed both the Neu and TβRII-AS transgenes (Fig. 1a, left panel). Additionally, as expected (Muller WJ, personal communication), RT-PCR analysis indicated that all the mammary tumors isolated from MMTV/activated Neu transgenic animals expressed the Neu transgene (Fig. 1a, right panel). In control experiments conducted in the absence of reverse transcriptase, no PCR products were generated for any of the transgenes (data not shown), indicating that the polyA+ RNA was free of genomic DNA contamination. Evaluation of the activated Neu and transforming growth factor-β type II receptor antisense RNA (TβRII-AS) gene expression in mouse mammary tumor virus (MMTV) transgenic mouse mammary tumors and the derived cell lines. 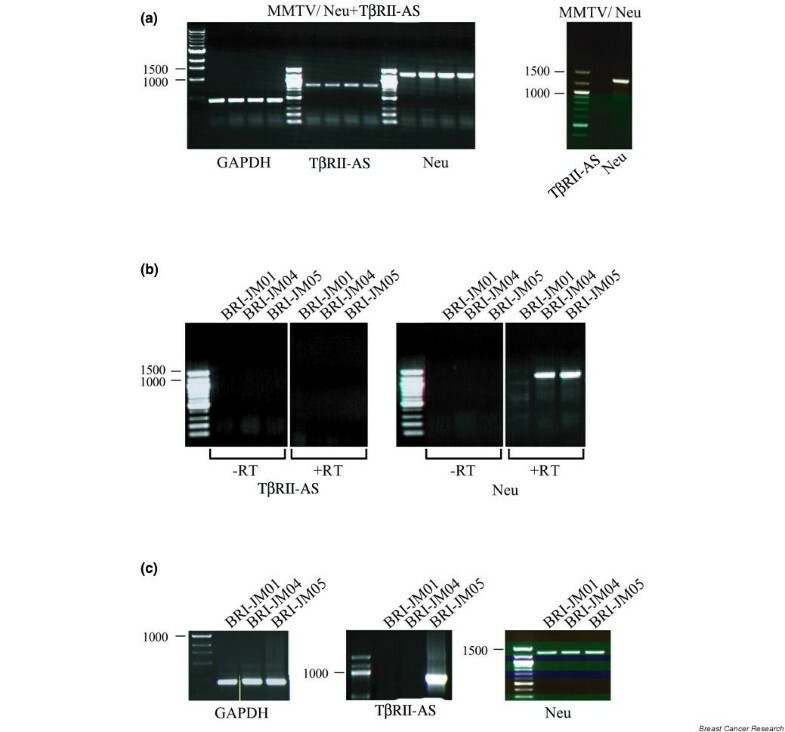 (a) Activated Neu and TβRII-AS transgene expression was determined by RT-PCR in four independent MMTV/activated Neu + TβRII-AS mammary tumors (left panel), in one MMTV/activated Neu mammary tumor (right panel), and (b) the BRI-JM01, BRI-JM04 and BRI-JM05 cell lines. First strand reactions were carried out in the presence or absence of reverse transcriptase (± RT). (c) Genomic DNA obtained from the BRI-JM01, BRI-JM04, and BRI-JM05 cell lines was evaluated by PCR for the presence of the TβRII-AS (middle) and activated Neu (right) transgenes. Glyceraldehyde-3-phosphate dehydrogenase (GAPDH) was used as positive control (parts a and c, left panels). In contrast to the results obtained with the tumor samples, RT-PCR analysis of the BRI-JM01 and BRI-JM05 cell lines (which were established from MMTV/activated Neu + TβRII-AS bigenic tumors) unexpectedly indicated that the TβRII-AS transgene was not expressed (Fig. 1b, left panel). The BRI-JM04 cell line (from an MMTV/activated Neu mammary tumor) did not contain the TβRII-AS message, as expected. PCR analysis, using genomic DNA isolated from the three cell lines, showed that the lack of TβRII-AS expression in the BRI-JM01 cells was due to the loss of the TβRII-AS sequence from the genome (Fig. 1c, middle panel). In contrast, the PCR analysis showed that BRI-JM05 genomic DNA contained the TβRII-AS sequence, implying that some form of gene silencing was responsible for the loss of TβRII-AS expression in this cell line (Fig. 1c, middle panel). With respect to Neu transgene expression, RT-PCR and PCR analysis showed that all three cell lines carried the Neu oncogene sequence in their genomes (Fig. 1c, right panel); however, only the BRI-JM04 and BRI-JM05 cells expressed the Neu transgene (Fig. 1b, right panel). The results of these PCR and RT-PCR analyses are summarized in Table 1 and indicate that these cell lines will not serve as good models for studying the effect of TβRII-AS expression on TGF-β signaling because the expression of the TβRII-AS transgene was not maintained. However, the results do suggest that these lines may be useful for studying TGF-β signaling in the absence (BRI-JM01) versus presence (BRI-JM04 and BRI-JM05) of activated Neu oncogene signaling. The procedures that were used to establish these new cell lines favor the isolation of epithelial cells. However, using light microscopy, we observed that only the BRI-JM01 cells exhibited the typical epithelial-like polygonal morphology (Fig. 2a). Flow cytometry (Fig. 2b), using an anti-E-cadherin antibody and nonpermeabilized cells, revealed that more than 95% of the cells in the three cell lines expressed cell surface E-cadherin, confirming their epithelial character. Evaluation of the morphologic character of the BRI-JM01, BRI-JM04, and BRI-JM05 cell lines. 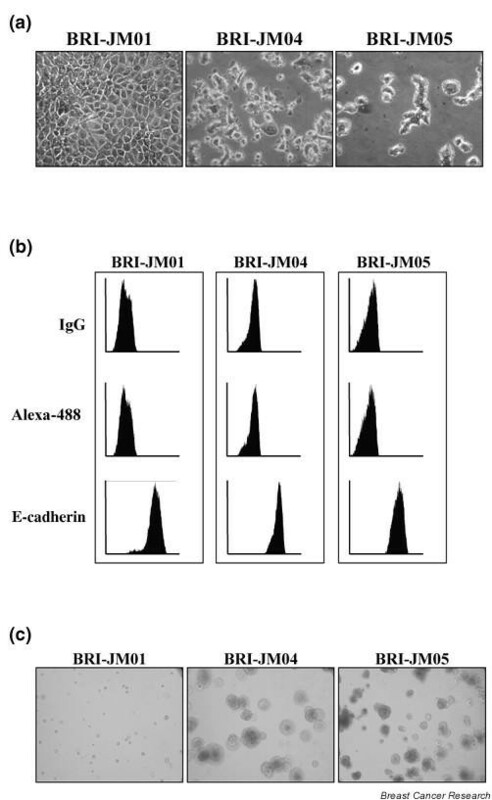 (a) Phase contrast microscopy revealed the typical epithelial 'cobble-stone'-like morphology for the BRI-JM01 cell line, as compared with the morphology of the BRI-JM04 and BRI-JM05 cell lines. (b) Flow cytometry revealed that the cell populations of all three cell populations are more than 95% positive for the junctional epithelial marker E-cadherin. Cells labeled with either an irrelevant primary isotype equivalent antibody (HA) or the secondary antibody alone (Alexa-488) served as negative controls (top and middle panel, respectively). (c) BRI-JM04 and BRI-JM05 cells seeded in Matrigel grew within 2 weeks, whereas BRI-JM01 cells grew at a slower rate. Next, we determined the doubling time and the plating efficiency of the three mammary tumor cell lines. The BRI-JM01 cell line exhibited the shortest doubling time (14 hours) and a relatively high plating efficiency (78%). BRI-JM04 and BRI-JM05 cells were shown to have much longer doubling times (22 and 25 hours, respectively) and lower plating efficiencies (55% and 41%, respectively). Using flow cytometry, we determined the cell cycle distribution of exponentially growing BRI-JM01, BRI-JM04, and BRI-JM05 cells. The S+G2/M ratio confirmed that the BRI-JM01 cell line contained the most rapidly growing cell population, whereas the BRI-JM04 and BRI-JM05 populations multiplied more slowly (Table 2), which is consistent with the doubling time results. It is interesting that the one cell line that did not maintain expression of the activated Neu oncogene exhibited the fastest growth rate. Murine NS0 cells were used as control. Culturing the three cell lines for several passages in phenol red-free modified Eagle's medium containing 10% charcoal-stripped/dextran-treated bovine serum did not alter their growth characteristics, indicating that these cells are able to grow in the absence of steroid hormones. Anchorage independent growth of the cells in soft agar, and growth of the cells in three-dimensional culture (Matrigel) was assessed. Only the BRI-JM05 cells were capable of forming colonies in soft agar; however, the clonogenic capacity of this cell line was under 5% (data not shown). 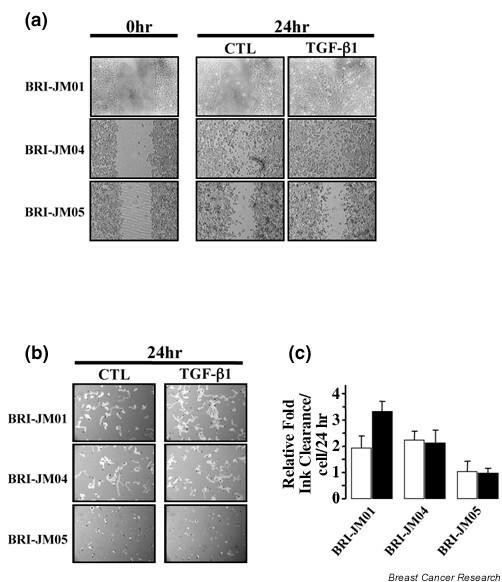 Both the BRI-JM04 and BRI-JM05 cell lines proliferated relatively rapidly in Matrigel and formed structures approximately 50–100 μm in diameter within 2 weeks after seeding the cells (Fig. 2c). The BRI-JM01 cell line also formed structures but at a slower rate, with structures of approximately 25–50 μm in diameter being detected after 2 weeks of culturing. We demonstrated that the BRI-JM04 and BRI-JM05, but not the BRI-JM01, cells express the message for the activated Neu oncogene (Fig. 1b). Next, we wished to determine the growth response of the three cell lines to EGF and HRG-β1 by measuring [3H]thymidine incorporation, and to correlate this response with the levels of expression of the ErbB-1, ErbB-3 and ErbB-4 receptors, in addition to that of the activated Neu receptor. The BRI-JM01 and BRI-JM04, but not the BRI-JM05 cells, were growth stimulated by recombinant human EGF (Fig. 3a), whereas only the BRI-JM01 cells were significantly stimulated by HRG-β1 (Fig. 3b). Western blot analysis (Fig. 3c) showed that the BRI-JM01 and BRI-JM04 cells expressed significant levels of ErbB-1, whereas the BRI-JM05 cells expressed much lower levels of ErbB-1. Western blot analysis also showed that the BRI-JM04 and BRI-JM05 cells expressed high levels of the activated Neu protein (Fig. 3c), confirming the RT-PCR data (Fig. 1b). In addition, immunoprecipitation of the ErbB-2/Neu receptor followed by western blot analysis using an anti-phosphotyrosine antibody showed that the receptor was highly phosphorylated in the activated Neu expressing BRI-JM04 and BRI-JM05 cell lines (Fig. 3c). Finally, all three cell lines expressed relatively high levels of ErbB-3 and ErbB-4 receptors. The correlation between ErbB-1, ErbB-2, ErbB-3, and ErbB-4 receptor expression and recombinant human EGF and HRG-β1 responsiveness is discussed in terms of receptor expression and heterodimer formation below. Growth response of the three cell lines to recombinant human epidermal growth factor (hEGF), heregulin (HRG)-β1, and transforming growth factor (TGF)-β1. [3H]thymidine incorporation measured in BRI-JM01, BRI-JM04, and BRI-JM05 cell lines after 24 hours of exposure to serial dilutions of (a) hEGF, (b) HRG-β1, or (d) TGF-β1. Experiments were conducted in quadruplicate and repeated three times with similar results (for details see text). (c) Western blot analysis of whole cell lysates (20 μg total protein/lane) evaluating ErbB-1, ErbB-2, ErbB-3, and ErbB-4 expression. Additional ErbB-2/Neu immunoprecipitations showed this receptor to be highly phosphorylated in the BRI-JM04 and BRI-JM05 cells. (e) Affinity cross-link labeling of the TGF-β type I, II, III receptors expressed on the BRI-JM01, BRI-JM04 and BRI-JM05 cells using [125I]TGF-β1 in the absence (-) or presence (+) of 100× excess of unlabeled TGF-β1. Enzymatic deglycosylation using both heparinitase I/II/III and chondroitinase ABC collapses the diffusely migrating TGF-β type III receptor band to a core protein (approximately 115 kDa, indicated as TβRIII**) labeled with either [125I]TGF-β1 or [125I]TGF-β2. TGF-β responsive Mv1Lu cells served as a positive control in the TGF-β growth assay and the cell surface cross-link affinity labeling studies. (f) RT-PCR analysis of BRI-JM01 mRNA using two different primer sets (set 1, set 2) confirmed the presence of TGF-β type III receptor transcripts in the BRI-JM01 cells. TGF-β type III receptor-expressing BRI-JM05 cells (part e) were used as a positive control for TGF-β type III receptor expression, and glyceraldehyde-3-phosphate dehydrogenase (GAPDH) was used as an internal standard. Experiments were repeated twice with similar results. Treatment with TGF-β1 in the presence of serum resulted in growth inhibition of all three cell lines (Fig. 3d), as might be expected of cells of epithelial origin. Cross-link affinity labeling of cell surface TGF-β receptors using [125I]TGF-β1 revealed the presence of two receptors with molecular weights of 53 kDa and 70 kDa on the three cell lines (Fig. 3e, upper panel), whereas a third receptor (molecular weight approximately 250 kDa) could be detected on only the BRI-JM04 and BRI-JM05 cells. These molecular weights are characteristic of type I, II, and III TGF-β receptors. The identity of the type II and III TGF-β receptors was confirmed by immunoprecipitation of the [125I]TGF-β1 cross-link affinity labeled receptors, using specific antibodies (data not shown). In the case of type I TGF-β receptors, it is known that TGF-β most often interacts with and activates the Alk-5 type I receptor. However, it is also capable of interacting with and activating another type I receptor, termed Alk-1 . In all three cell lines, using specific antibodies, we determined that the affinity labeled 53 kDa receptor corresponded to Alk-5 and not Alk-1. The type III receptor is known to contain heparin and chondroitin sulfate glycosaminoglycan chains, which results in it exhibiting a diffuse migration pattern on SDS-PAGE. In order to collapse the type III receptor into a tighter band and thereby enhance our ability to detect it at the cell surface, we treated the three cell lines with heparinitase I, II and III, and chondroitinase ABC before cross-link affinity labeling with [125I]TGF-β1 or [125I]TGF-β2 (Fig. 3e, bottom panels). Although, as expected, this deglycosylation procedure collapsed the TβRIII receptor band into a labeled core protein of approximately 115 kDa on the BRI-JM04 and BRI-JM05 cells, it did not reveal the presence of the TβRIII receptor on the BRI-JM01 cells. However, RT-PCR analysis (using two independent sets of TβRIII specific primers) indicated that these cells express the TβRIII message (Fig. 3f). These results indicate that either the TβRIII message is not translated efficiently or that trafficking of the TβRIII to the cell surface is impaired in these cells. Table 3 summarizes the ErbB receptor and TGF-β receptor expression patterns in the three cell lines, and Table 4 gives an overview of their responsiveness to TGF-β1, recombinant human EGF and HRG-β1. TβRI/TβRII/TβRIII, transforming growth factor-β type I/II/III receptor; TGF, transforming growth factor. hEGF, recombinant human epidermal growth factor; HRG, heregulin; TGF, transforming growth factor. TGF-β is known to stimulate motility in several epithelial cell lines, including the NMuMG and EpH4 mammary epithelial cell lines. We therefore assessed the endogenous, and TGF-β1-induced, motility of the three cell lines that we have isolated using two independent assays. In the first assay, confluent monolayers of cells were 'wounded' with a pipet tip, and the movement of the cells into the wound area was monitored in the absence or presence of 100 pmol/l TGF-β1. Figure 4a shows that BRI-JM01 cells exhibited a TGF-β1-induced increase in motility. This 'wound healing' effect was not due to an increase in cell proliferation because we demonstrated that these cells were clearly growth inhibited by 100 pmol/l TGF-β1 (Fig. 3d). In contrast, TGF-β1 did not affect the motility of the BRI-JM04 and BRI-JM05 cell lines in the wound assay. Transforming growth factor (TGF)-β1 induces increased motility in the BRI-JM01 cell line. Endogenous (CTL) and TGF-β1-induced motility of the BRI-JM01, BRI-JM04, and BRI-JM05 cells was determined in a (a) wound-closure assay and a (b) black ink-assay (see text for details). Each experiment was repeated at least twice, with similar results. (c) Particle-free tracks were quantitated (using ImageJ freeware) and expressed as the relative fold ink clearance (± standard error of the mean) of the least motile BRI-JM05 cell line 24 hours after seeding the three cell line in the absence (white bars) or presence of 100 pmol/l TGF-β1 (black bars). BRI-JM01 and BRI-JM04 cells are approximately twice as motile as the BRI-JM05 cells; however, TGF-β1 only stimulates the motility of the BRI-JM01 cells (for details see text). The second assay is a 'black ink assay' in which the cells were sparsely seeded on an ink-coated surface and then monitored for cell movement, which appears as ink particle cleared tracks on the plastic. This motility assay confirmed the results of the wound assay (i.e. the presence of TGF-β1 significantly increased the motility of the BRI-JM01 cells, but not of the BRI-JM04 and BRI-JM05 cells; Fig. 4b). Quantification of these particle-free tracks using ImageJ software showed that the basal motility of the BRI-JM01 and BRI-JM04 cells was approximately twice that of the BRI-JM05 cells, and that TGF-β1 stimulated the motility of the BRI-JM01 cells approximately 1.7-fold (Fig. 4c). Using phase contrast microscopy, we also observed that, in addition to having their growth inhibited and their motility stimulated by TGF-β1, BRI-JM01 cells exhibited a striking morphologic change in response to this growth factor, either in the presence (Fig. 5a) or in the absence (data not shown) of serum. The appearance of the cells changed from a homogeneous epithelial-like cuboidal morphology to a spindle-shaped morphology (Fig. 5a, phase contrast). We therefore investigated whether these cells were undergoing an EMT similar to that described for the NMuMG and Ras-transformed EpH4 cells [22, 23] by evaluating the expression and/or relocalization of several epithelial and mesenchymal markers. Transforming growth factor (TGF)-β1 induces an epithelial-to-mesenchymal transition (EMT) in the BRI-JM01 cell line. (a) Immunofluorescence microscopy demonstrating the altered localization of E-cadherin, N-cadherin and β-catenin, the rearrangement of F-actin and vimentin filaments, and the disappearance of ZO-1 that accompany the TGF-β1 induced EMT (see text for details). (b) Flow cytometry of nonfixed live cells monitoring the presence of E-cadherin at the cell surface of BRI-JM01 cells that were exposed to TGF-β1 for up to 120 hours. Nonspecific isogenic IgG (HA) and cells grown in the absence of TGF-β1 (CTL) were used as a negative and positive control, respectively. (c) Western blot analysis determining the total cellular content of E-cadherin, N-cadherin and β-catenin in BRI-JM01 cells cultured for 24, 72 and 120 hours in the absence (CTL) or presence of TGF-β1 (see text for details). (d) BRI-JM01 cells were treated with TGF-β1 for 48 hours (BRI-JM01T) and passaged several times in the absence of this growth factor. When seeded in Matrigel these 'TGF-β1 primed' BRI-JM01 cells formed larger three-dimensional structures than did the nontreated cells. Using immunofluorescence microscopy, we observed that the BRI-JM01 cells were indeed undergoing an EMT-like process, which was characterized by the following: relocalization of the cell adhesion proteins E-cadherin, N-cadherin, and β-catenin; loss of the tight junctional protein ZO-1; acquisition of actin stress fibers; and reorganization of the cytoskeletal intermediate filament protein vimentin (Fig. 5a). Flow cytometric analysis, using an anti-E-cadherin antibody and nonpermeabilized cells, confirmed that TGF-β1 exposure caused a relocalization of E-cadherin. Cell surface E-cadherin expression decreased approximately 50% after 48 hours, and almost 100% after 120 hours of TGF-β1 treatment (Fig. 5b). Immunoblot analysis of whole cell lysates showed that the effect on E-cadherin was primarily one of relocalization because the total E-cadherin content of BRI-JM01 cells was only slightly diminished over the TGF-β1 time course (Fig. 5c). A similar phenomenon was observed for N-cadherin and β-catenin (i.e. both proteins translocate from the cell surface to cytosolic compartments upon TGF-β1 exposure [Fig. 5a], with no significant decrease in total protein [Fig. 5c]). There is an ongoing discussion in the literature as to what criteria may be used to define an EMT in vitro and to distinguish the EMT phenotype from a 'scattering' phenotype . Both phenotypes exhibit disruption of cell junctions, fibroblastoid morphology, and enhanced motility. However, it has been suggested that they can be distinguished by reversibility studies with the EMT phenotype, but not the scattering phenotype, persisting after withdrawal of the stimulus . 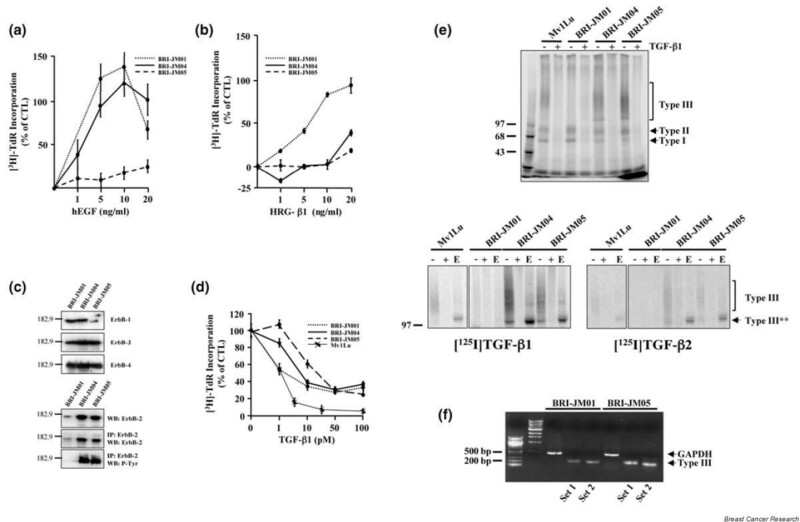 We investigated the reversibility of the EMT phenotype in the BRI-JM01 cells by treating cells with TGF-β1 for 48 hours and then culturing them for at least five passages in the absence of TGF-β1. In two-dimensional culture on plastic, these cells maintained their mesenchymal morphology (data not shown). When grown for 3 weeks in three-dimensional culture in Matrigel, the TGF-β1 'primed' cells formed larger structures than did the nontreated BRI-JM01 cells (Fig. 5d). Together, these results indicate that, in the BRI-JM01 cells, EMT is maintained as a metastable phenotype that is independent of TGF-β1 stimulation. The present study describes the characterization of three new mouse epithelial cell lines (BRI-JM01, BRI-JM04, and BRI-JM05) derived from mammary tumors arising in MMTV/activated Neu or MMTV/activated Neu + TβRII-AS transgenic animals. Although all tumor samples were shown to express the expected transgene(s) by RT-PCR (i.e. activated Neu or activated Neu + TβRII-AS), the derived cell lines failed to express one or both of the transgenes. Both of the cell lines that were established from MMTV/activated Neu + TβRII-AS bigenic tumors (the BRI-JM01 and BRI-JM05 cells) did not express the TβRII-AS transgene. The lack of expression of the TβRII-AS transgene in the BRI-JM01 cells was due to deletion of the transgene from the genome, whereas in the BRI-JM05 cells the gene was present in genomic DNA but was not expressed. With respect to Neu transgene expression, all three cell lines carried the Neu oncogene sequence in their genomes, but only the BRI-JM04 and BRI-JM05 cells expressed the Neu transgene message and the constitutively phosphoryated ErbB-2/Neu protein. We examined the general morphology and growth characteristics of the three cell lines and observed that the BRI-JM01 cells exhibited a very short doubling time and high plating efficiency, as compared with the BRI-JM04 and BRI-JM05 cells. This result is somewhat surprising considering that the BRI-JM01 cells are the one cell line that does not express the Neu oncogene. Despite the expression of the cell adhesion protein E-cadherin by all three lines, only the BRI-JM01 cells exhibited a typical 'cobble-stone' epithelial morphology. The lack of a typical epithelial morphology by the BRI-JM04 and BRI-JM05 cells may be due to their high level of Neu expression. In addition to determining the level of expression of the Neu/erbB-2 transgene protein in the three cell lines, we also examined the level of expression of the ErbB-1, ErbB-3 and ErbB-4 receptors, and correlated the ErbB receptor expression patterns with the growth responses to EGF and HRG-β1. EGF is the primary ligand for the ErbB-1 receptor, whereas HRG-β1 binds and activates ErbB-3 and, to a lesser extent, ErbB-4 . We found that the BRI-JM01 cells were growth stimulated by both recombinant human EGF and HRG-β1, whereas the BRI-JM04 cells were stimulated only by recombinant human EGF. In contrast, the BRI-JM05 cells were rather insensitive to both recombinant human EGF and HRG-β1. Immunoblot analysis showed that the BRI-JM01 cells expressed significant levels of ErbB-1, ErbB-3 and ErbB-4 receptors; that BRI-JM04 cells expressed high levels of ErbB-1, ErbB-2, ErbB-3 and ErbB-4 receptors; and that BRI-JM05 cells expressed high levels of ErbB-2, ErbB-3 and ErbB-4 receptors. The relatively high level of ErbB-1 receptors in the BRI-JM01 and BRI-JM04 cells probably accounts for their responsiveness to recombinant human EGF as compared with the BRI-JM05 cells. The presence of ErbB-1 and ErbB-3 receptors in the BRI-JM01 cells should enable the formation of ErbB-1/ErbB-3 heterodimers, thereby accounting for the responsiveness of these cells to HRG-β1. The relative insensitivity of the BRI-JM04 and BRI-JM05 cells, which also express the ErbB-1 and ErbB-3 receptors, to HRG-β1 may be explained by the fact that these cells express high levels of activated Neu, which is capable of dimerization with ErbB-3 in a ligand independent manner. Accordingly, it may sequester the ErbB-3 receptor and therefore prevent it from heterodimerizing with ErbB-1 in response to HRG-β1. We also determined for the three cell lines the level of expression of the TGF-β type I, II and III receptors, and their growth and motility responses to TGF-β. The BRI-JM04 and BRI-JM05 cells expressed similar levels of the TGF-β type I, II and III receptors, whereas the BRI-JM01 cells expressed similar levels of the TGF-β type I and II receptors but no detectable type III receptor. All three cell lines were growth inhibited by TGF-β1. This is not unexpected for breast epithelial cells, which express the type I and II receptors, and indicates that the downstream signaling components that are critical for the growth inhibitory response have not been inactivated in these cell lines. With respect to their response in the two motility assays, the presence of TGF-β1 significantly increased the motility of the BRI-JM01 cells, but not the BRI-JM04 and BRI-JM05 cells. Several lines of evidence in mouse models and humans indicate that TGF-β signaling promotes late stage tumor progression/metastasis in spite of its tumor suppressor effects in early tumorigenesis, and that this tumor promoter effect correlates with its ability to promote an EMT in tumor epithelial cells [23, 38]. Most current studies examining the molecular mechanisms that underlie the EMT process are performed in vitro with cultured epithelial cell lines that convert to a fibroblast-like morphology under specific conditions. In the case of breast epithelial cell lines, most do not respond to TGF-β with a recognizable EMT response. This may be due to the fact that culture conditions do not always maintain cell polarity and/or facilitate motility. In combination with this, the gene expression program of individual cell lines may be such that intrinsic inhibitory mechanisms are expressed, or that downstream mediators are not expressed. Having observed that TGF-β1 significantly increased the motility of the BRI-JM01 cells, we investigated this cell line further to determine whether it was responding to TGF-β with an EMT response similar to that described for the NMuMG and Ras-transformed EpH4 breast epithelial cell lines. Currently, the criteria for defining an EMT in vitro has varied in different studies, but it is generally accepted that it involves, in addition to an increase in cell motility, the acquisition of a mesenchymal morphology and mesenchymal markers, the dissolution of epithelial cell–cell contacts, and a remodeling of the cytoskeleton. Additionally, it has been suggested that a true EMT phenotype is metastable (i.e. eventually it becomes independent of exogenous stimuli) . We observed that the BRI-JM01 cells exhibited a rapid and synchronous morphologic response to TGF-β1, with the cells exhibiting a homogeneous epithelial-like cuboidal morphology before treatment and a relatively homogeneous spindle-shaped morphology after treatment. With respect to the dissolution of epithelial cell–cell contacts, using immunofluorescence microscopy we found that the cell adhesion proteins E-cadherin, N-cadherin, and β-catenin were relocalized away from the cell surface, and that the total amount of the tight junctional protein ZO-1 significantly decreased after TGF-β treatment. The cytoskeletal intermediate filament protein vimentin, a mesenchymal marker, was expressed before treatment, but it was reorganized into filamentous structures upon treatment. The presence of vimentin in the untreated cells, which have a clear epithelial morphology, may not be surprising because its transcription is very sensitive to serum factors , rendering its presence per se an unreliable marker of mesenchymal cells. In reversibility studies, we found that the mesenchymal morphology of the BRI-JM01 cells was maintained in two-dimensional culture for several passages after removal of TGF-β1. Additionally, differences in growth in three-dimensional Matrigel cultures could be observed 3 weeks after seeding the TGF-β1 'primed' cells in Matrigel. Because reversibility may be a feature that distinguishes a 'scattering' phenotype from an EMT phenotype, we suggest that the BRI-JM01 cells may be regarded as undergoing a relatively complete EMT process. It is of interest to examine the characteristics that the BRI-JM01, NmuMG, and Ras-transformed EpH4 cell lines have in common in order to gain insight into what may predispose these breast epithelial cell lines to undergo an EMT in response to TGF-β. A distinguishing feature of the BRI-JM01 cells, at least as compared with the BRI-JM04 and BRI-JM05 cells, is their apparent lack of expression of the type III TGF-β receptor. It is unlikely that this accounts for their ability to exhibit an EMT response to TGF-β, however, because NMuMG cells express this receptor at a significant level (data not shown). Another distinguishing feature of the BRI-JM01 cells is their lack of expression of the activated Neu oncogene, even though they were isolated from tumors expressing this oncogene. Because both the NMuMG and EpH4 lines are nontransformed mouse mammary epithelial cell lines, a lack of oncogene expression may be a characteristic that they share with the BRI-JM01 cells. However, in the case of the EpH4 cells, the EMT response to TGF-β requires the expression of Ras variants that induce hyperactivation of the extracellular signal-regulated kinase/MAPK pathway [22, 23]. We have found that the TGF-β-induced EMT response of the BRI-JM01 cells is not inhibited by the farnesyltransferase inhibitor L-744832 (data not shown), suggesting that the EMT response of these cells does not depend on the presence of activated Ras. Based on the preceding discussion, it would appear that the cell line that the BRI-JM01 cells most resemble in terms of their TGF-β-induced EMT response is the NMuMG cell line. However, in that cell line, the ALK-1 TGF-β type I receptor was implicated as mediating the TGF-β-induced EMT . In the BRI-JM01 cells, we found that the prototypic TGF-β type I receptor ALK-5 is expressed, whereas ALK-1 is not. This indicates that a TGF-β-induced EMT can be mediated either by ALK-1 or ALK-5, depending upon the cell context. One other unusual characteristic of the BRI-JM01 cells is that they express N-cadherin in addition to E-cadherin. Various studies have shown that E-cadherin is involved in maintenance of the normal phenotype of epithelial cells . In contrast, it has been demonstrated that expression of another member of the cadherin family, namely N-cadherin, actually may contribute to an invasive phenotype. For example, it was shown that expression of N-cadherin in BT-20 and MCF7 human breast epithelial cell lines increased cell motility and invasion [40, 41]. Additionally, based on the activities of E-cadherin and N-cadherin chimeras, it has been concluded that a 69 amino acid portion of the extracellular domain of N-cadherin is necessary and sufficient to promote an EMT in squamous epithelial cells . In the case of the BRI-JM01 cells, the presence of N-cadherin at the cell surface was not sufficient to promote an EMT because the untreated cells expressed surface N-cadherin, yet maintained an epithelial-like cuboidal morphology. It may be, however, that the basal expression of N-cadherin in these cells predisposed them to undergo a TGF-β-induced EMT. Evidently, there may be other genes, in addition to N-cadherin, that are basally expressed in the BRI-JM01 cells that are important for rendering them capable of exhibiting a TGF-β-induced EMT response in vitro. We have evidence that this particular basal gene expression program probably arose because of genetic events occurring during the development of the tumor, rather than during immortalization in culture, because two other cell lines independently isolated from the same tumor as the BRI-JM01 cells exhibited the same characteristics with respect to their TGF-β-induced EMT response. In summary, we isolated three new mouse mammary tumor cell lines, one of which undergoes a TGF-β-induced EMT response. The EMT response of these BRI-JM01 cells resembles that which occurs in the NMuMG cell line; however, in our hands it is much more homogeneous and synchronous. We propose that the BRI-JM01 cells may serve as a useful model, in addition to the NMuMG and EpH4 cell lines, for studying the signal transduction pathways that control the various steps that are involved in EMT. We are currently analyzing cDNA microarray and proteome data obtained from these cells to identify genes and proteins with expression that is specifically associated with EMT. The identification of these genes/proteins is essential for improving our understanding of the role of the EMT process in the progression of breast carcinomas. We thank S Bergeron and A-M Boyer for maintaining the transgenic mice, and Lucie Bourget and Myriam Banville for technical assistance with the flow cytometry experiments and the soft agar assays, respectively. All animals entered in this project were treated in a humane manner according to the regulations of the Canadian Council on Animal Care. AEGL was supported by a National Sciences and Engineering Council of Canada (NSERC) postgraduate fellowship.